Staying true to its name, the Breitling Premier Day and Date boasts day and date windows at 12 o'clock and 6 o'clock respectively. 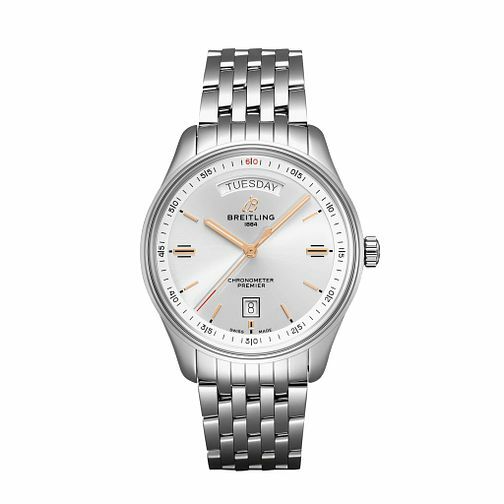 This subtle and elegant design, inspired by the 1940s, features a 40mm stainless steel case, silver dial, rose gold details, and a seven-row stainless steel bracelet, alongside three grooves in the case by the crown - a signature of the Premier collection. Powered by the chronometer-certified self-winding Breitling Caliber 45 movement with a 38 hour power reserve. You'll be sure to find yourself checking the time, day, and date far more often when wearing this watch. The silver dial Premier Day & Date is also available on a brown crocodile strap.